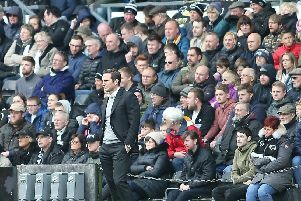 Young midfielder Mason Mount celebrated his first hat-trick in English football and aimed to strike further goals to propel Derby County into the Championship play-offs. After an opening Craig Bryson goal late in the first-half against struggling Bolton Wanderers, Mount doubled the lead moments before the break. He completed his treble with two second-half strikes to take his tally to ten goals for the season and leave the Rams two points and two places outside the play-offs. Mount said: “My goal after being out for a long time and coming back in was to score goals and be a big part of the team. It was the first hat-trick in English football for the youngster and the second of his career after he hit one on loan at Vitesse Arnhem. Mount added: “It is the best feeling when you score a goal so to score three times in a game is unbelievable. Back-to-back victories at Pride Park have kept the Rams in the hunt for a place in the Premier League. “The whole team, we were brilliant,” said Mount. “We knew it was going to be a tough game because Bolton are fighting for their lives.